A friend of mine will soon see her baby for the first time. Due in 2 months and preparing for her baby’s arrival, her life is about to change forever. I remember those first couple years of motherhood. Suddenly you are in “the club” only you are a rookie; and sometimes the club is not too kind to the newbies. All this well-meaning advice can be hard on a new mom. While finding their way and trying to do what is best for their baby and themselves, it can be difficult to stand your own ground. Unfortunately, the sense of self-doubt tends to stay with moms as we continually wonder if we are making the right choices for our kids. As I became more experienced as a mom I began to see my own judgemental nature. I was a mostly ‘stay at home mom’, an ‘attachment’ parent who kept my babies close at night and in a sling by day. Wasn’t that the BEST way to be a mom?? Now, after many years of homeschooling, my kids are in school full-time and I am running a full-time professional practice. I am still the same mom. I have met many stay at home mom’s who feel it is the ONLY way to raise a child. And I know many working mom’s who feel that THEIR way is the only way. Having been on both sides of the fence I can say that there just is no “one right way” to be a mom. What IS the right way is to lose the judgement. Moms need to support each other. It is one of the most difficult journeys helping a child grow up to be responsible, kind and a positive member of society. As for the well-meaning advice….Ben now sleeps like the dead, Noah hasn’t sucked his thumb for at least 6 years, and the rash….that was food allergies. Nod and smile… and remember that there are many paths. at least one of us is tired.. 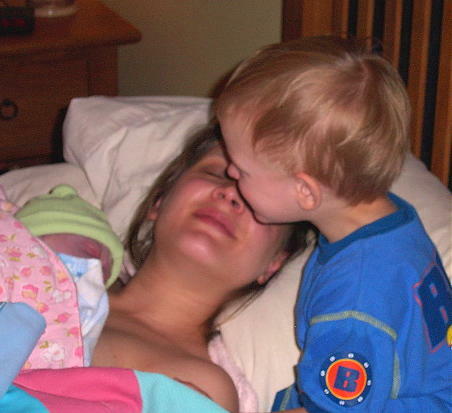 This entry was posted in personally speaking and tagged baby, judgements, motherhood. Oh so true. I am so lucky to have had my children after watching my sisters and brother raise theirs. I learned so much from you guys. But the best lessons I ever learned were “this too shall pass” for those horrid sleepless nights and it doesn’t matter what choice you make as long as it the right choice for you and your children. Thanks for being a good role mother for me. Oh, and about the soother thing. I certainly tried and it just never worked. You can send down N for a thumb sucking intervention in a year or so. Thanks Kerri. “This too shall pass” really is great advice. I remember calling Ruth on a regular basis in the early years just to hear those words! Ill prep Noah on the intervention! Instead of placing unrealistic expectations on one another, we should be supporting each other! We are hard enough on ourselves as it is; oh, mother-guilt! The best gift we can give to the women around us, is to cheer them on and love them unconditionally, wether we like the parenting choices they make or not. Once again, thanks for your wisdom Carlene. I appreciate how you embrace and include others no matter the topic you are writing about. As a mom who has always worked full-time and has had the good fortune to have my husband as a stay-at-home-dad for the past 14 years, I have had plenty of looks and comments. Sometimes they were outrightly negative, and other times wistful. Regardless, I think the vast majority of families do the best they can, no matter what their circumstances. And I would venture to say that none of them are perfect and most do a pretty good job. You’re insight is appreciated once again!